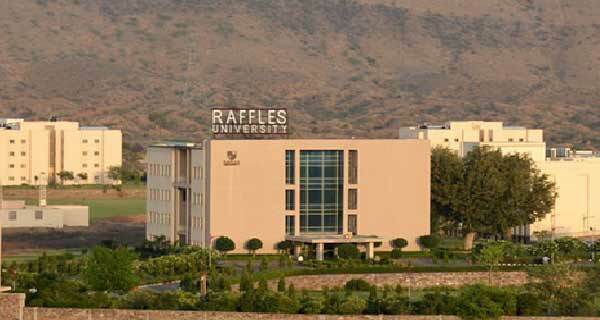 Raffles University is situated in NCR region, at Neemrana on New Delhi-Jaipur National Highway No. 8 and is just 2 hours’ drive from New Delhi, connected by a six lane express way. Raffles University provides a platform and environment for open discussions and interaction between the faculty and students and designed to ignite and serve the urge to explore and learn beyond boundaries. The curriculum and pedagogy in Raffles University matches with the global standards. Seminars, Conferences, workshops, Moot Court Competitions , Guest Lectures , internship programmes are all part and parcel of the course delivery. To mention few, Surana and Surana and School of Law National Moot Court Competition and C. L Agrawal Memorial National Moot Court Competition are regular annual features of the School of Law. Interested candidates can register themselves by filling up ‘Application Form’ available at the Neemrana campus or other City offices of the University. Application forms and prospectus are available on payment of Rs. 1000/- at Raffles University Campus or other City offices. Candidate can also apply Online through the website:- www.rafflesuniversity.edu.in/applyonline. Forms can also be downloaded and filled application form can be sent to “Raffles University Neemrana Office”. You may submit one Application Form per course. The completed Student Application Form must reach Raffles University Office no later than Last date. A student of law needs to understand law not just as it exists in the books but in its socioeconomic political & scientific context. Therefore, the study of these social sciences concurrently with study of law is an imperative in understanding and analyzing law in its various aspects. In addition to exposing the students to various allied & connected areas of law, the student needs to be equipped to understand and react to real life situation i.e.” law inaction”. We believe in developing competence with integrity, application of knowledge, skill & values. The idea of profession competence is the competence that’s required in their client centered behavior. Competence therefore depends upon the habits of mind that allow the practitioner to be attentive, curious, self-aware and willing to recognize & correct errors. Competence is the ability to do ability to do a task within the legal framework and is the process to uphold justice. The methods of teaching in the classroom as well as outside are oriented towards developing such skills in the students. The University gives utmost importance to reading and academic research amongst the faculty and the students. The university has established a central library, which is situated in the school of Engineering and Technology building. Central library has an excellence collection for books and other reading material. This is in addition to the departmental library to each of the Schools, wherein books of specialized disciplines and various related electronic resources and documents are provided. The libraries are well lit with comfortable seating arrangements conducive for long time reading, writing and research. In addition to providing reading material in all areas of specialization there is also a good collection of general reading material including new papers periodicals etc. are made available to the students. The University provides separate and independent halls of residence for boys and girls. The boy’s hostel has two independent four storied blocks suitably spread out for light and ventilation situated on the North West corner of the campus. The girls hostel is single four storied building situated almost centrally opposite the dining hall for convenient movement of girls students. The surrounding areas all being well lit adds to the safety and security of the girl’s students. The hostel provides well lit and single room facility with a choice of air-conditioning for those who desire. The rooms are well spaced out for easy movement and for general supervision. These have separate washrooms on each floor which is easily accessible from their individual rooms. The rooms have beds, wardrobes, table and a chair for reading and study with wall fitted shelves. Each of the hostels has resident warden and round the clock security. The presence of the wardens also adds to the homely atmosphere and so is the system of personal care especially in the girl’s hostel. Every effort is made to ensure safety and wellbeing of the inmates. Strict in and out timing and recording of student movement provides a conducive atmosphere for study and recreation. We provide a platform and environment for open discussion and interactions between the faculty and students and are designed to ignite and serve the urge to explore and learn beyond boundaries. Diversity and flexibility of options of courses to choose from is aimed at enabling students to pursue studies most suited to their intellect and talent. This would enable the students to discover, nurture and expand their individual talents, skills and interests so that they emerge as leaders and path breakers wherever they go.